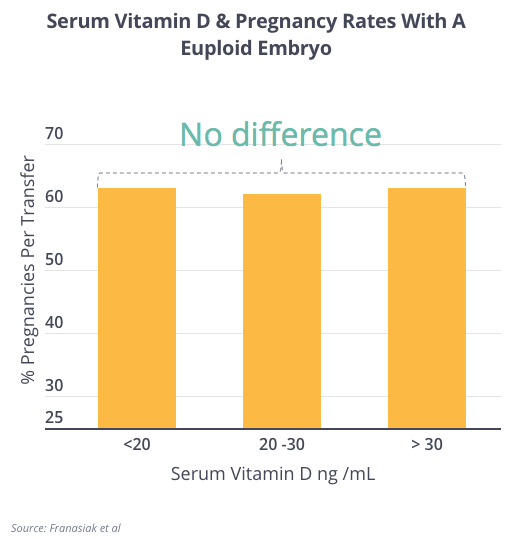 For women trying to conceive naturally, most of the studies available today show almost no association with Vitamin D levels. Three studies on the subject arrived at a similar conclusion. There have been a number of studies looking at whether Vitamin D plays a role in helping women conceive after IVF. In an effort to wrangle the data into one analysis, English investigators pooled 11 studies consisting of 2,700 cases and concluded that women with “replete” levels (more than >75 nmol per liter of blood) of Vitamin D enjoyed a 35% (relative) higher likelihood of delivering a baby than those who were Vitamin D “deficient” (less than 50 nmol per liter of blood). 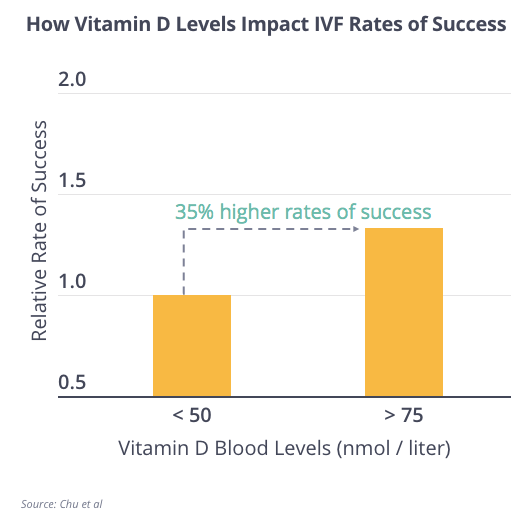 A few smaller, inferior studies showed little relationship between Vitamin D levels and IVF success. All in all, the data suggests that being Vitamin D deficiency is associated with worse outcomes. 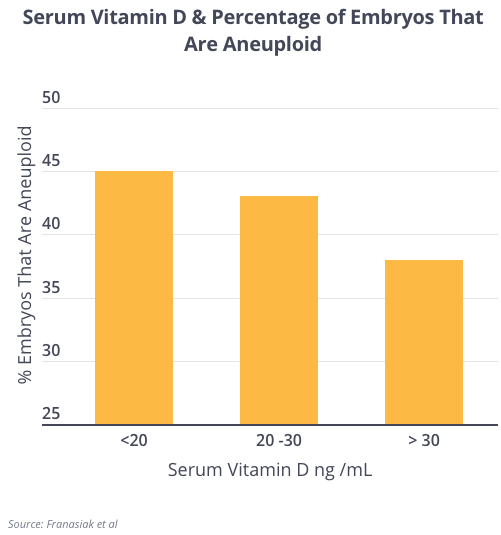 One possible culprit is that women who are Vitamin D deficient produce a higher percentage of aneuploid (chromosomally-abnormal) embryos that seldom, if ever, lead to live births. But once that hurdle is removed and a euploid (chromosomally-normal) embryo is available, it does not appear that a woman’s Vitamin D level is necessarily a factor. Specifically for women with PCOS, investigators have come to believe that being Vitamin D deficient during the time of ovulation induction correlated with a nearly 40% lower likelihood of live birth per cycle. Folate (the natural form of B9) and folic acid (the synthetic form of B9, often taken as a supplement) are incredibly helpful when trying to conceive, and once a woman has become pregnant. 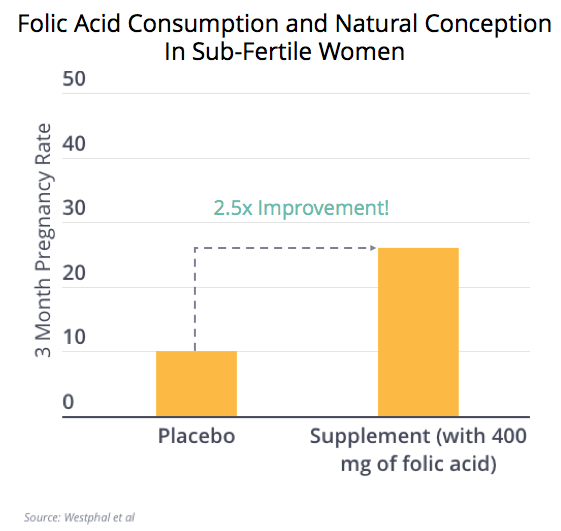 The data is convincing that folic acid improves fertility in the general population, and amongst those undergoing fertility treatment. It may even be beneficial at levels much higher than often suggested to women. 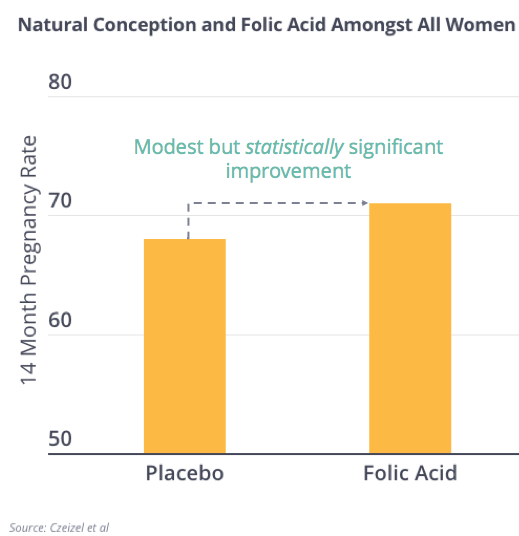 In addition, much of the concern that folic acid might also drive higher rates of miscarriage has largely been debunked. Let’s take a look. A well-designed Hungarian trial compared live birth rates amongst women in the general population trying to conceive naturally while given folic acid or a placebo. Over a 14 month period, live birth rates were higher in the folic acid group but one could debate how meaningful the disparity was. Similarly, a small group of women who had failed to conceive for up to 36 months were given a placebo or multidose vitamin (containing folic acid) and showed significantly higher rates of conception after three months of trying to conceive naturally. 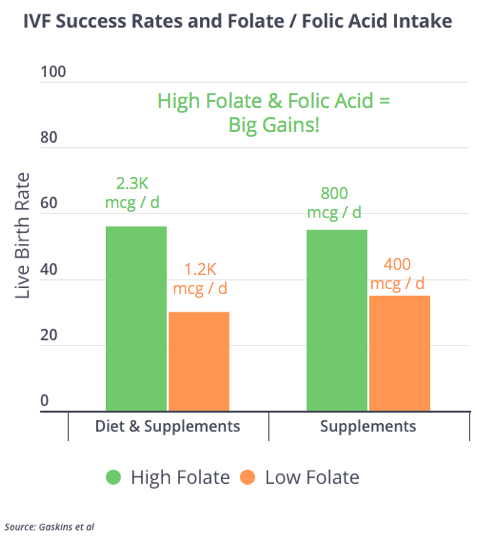 Amongst 230 women (age 35) undergoing IVF, those who received the highest volumes of folate (either through food or supplements) achieved higher (50 - 60%) live birth rates than women who received the least volume of folate (30 - 35%). What’s interesting here is that amongst women taking just supplements big gains can still be made far above the typically-prescribed 400 micrograms per day dose. As you will see in our next lesson on BPA exposure, women with high levels of folate received through diet were far less likely to suffer the negative effects of BPA exposure. One common question is whether there is a level of folate or folic acid intake that can be too high. Because the compound is water soluble, it’s hard to reach such levels because folate and folic acid are easily excreted through urine. In fact, for women with an MTFHR mutation, they likely need to be taking more than 1,000 mcg / day to enjoy its full benefit. At one point there was concern that folate consumption might coincide with higher risks of miscarriage or stillbirth but more recent analysis and study has overturned that concern and may even suggest folate consumption is beneficial in reducing miscarriage. The data is strong that consuming folate during pregnancy helps ensure the health of the offspring. As for men, most studies correlate high folate levels with higher sperm counts and greater levels of motility. 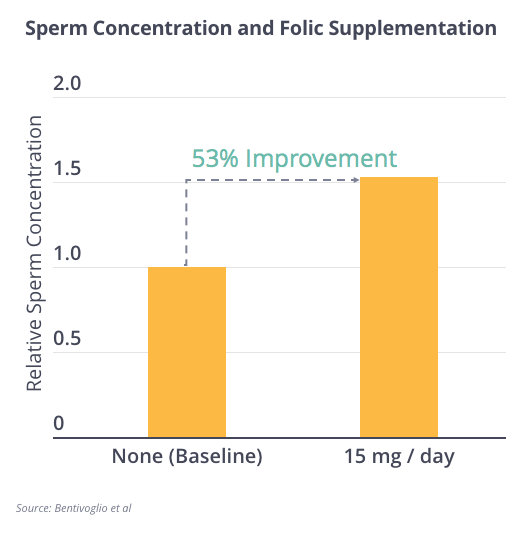 One smaller study out of Italy recorded that when male partners of infertile couples were given 15 mg of folic acid once per day for three months, sperm counts increased over 50% and motility ranges also improved. Generally speaking, the jury is still out on whether using antioxidants improves a woman’s fertility in the context of treatment. 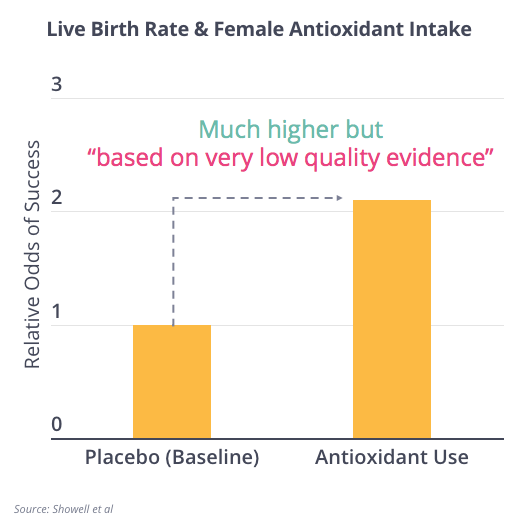 A meta-analysis of eight trials concluded “very low quality evidence suggests antioxidants may be associated with a high live birth rate” compared to placebos. 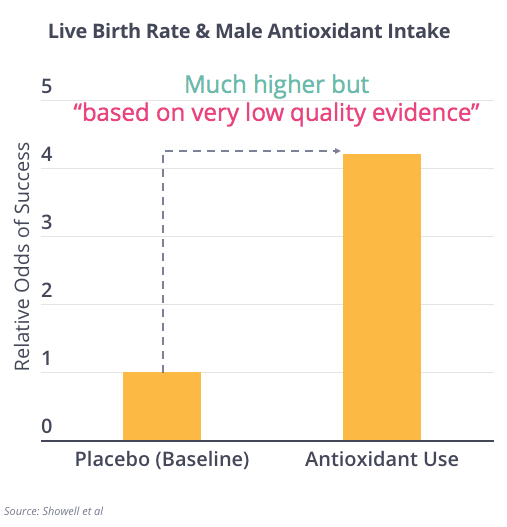 Generally speaking, the data on use of antioxidants for men trying to conceive through fertility treatment is also mixed. The same team who provided the above analysis for women did the same for men and arrived at a similar conclusion though working with even less data (four small studies).